It's been a long time since my last post and I won't bore you with the details as to why. But I am playing catch up, so please bear with me. The class theme for two lessons ago was 'In a tsubo vase'. That's a pot shaped vase with small opening used without a kenzan. This requires the students to find appropriate mechanics to support their work. At last class we had some fun with miniature ikebana. We all did several arrangements each and presented them on some sort of board. 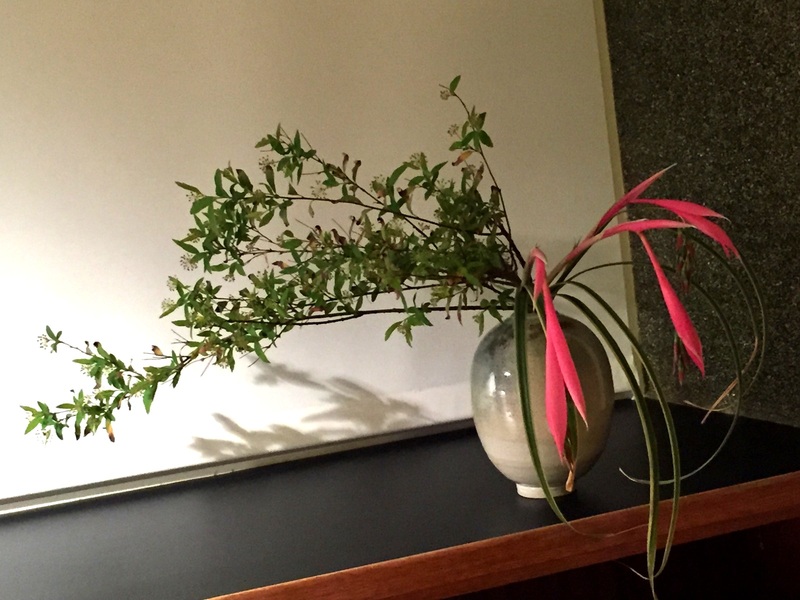 A friend of mine, whilst admiring my display, referred to them as little ikebana hors d'oeuvres. Miniatures appear to be easy but to do them correctly, we must not lose sight of the principles of Sogetsu ikebana. There is, also, the difficulty of mechanics. With tiny vases we cannot fit our usual horizontal or vertical fixtures or even kenzans, as we do with the larger vases, so we had to be a little bit more creative. I made seven arrangements and I could, quite happily, have done many more. I leave you with this simple but striking arrangement I made using a piece of agave that has been sitting in my garage for many weeks without water yet still looks fresh. With it I used some clivia berries.